None - No ticks appear. TopLeft - ticks appear above the track for a horizontal RadSlider, or to the left of the track for a vertical RadSlider. 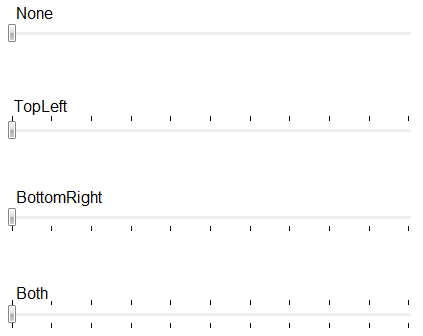 BottomRight - ticks appear below the track for a horizontal RadSlider, or to the right of the track for a vertical RadSlider. Both - ticks appear above and below the track bar for a horizontal RadSlider, or to the left and right of the track for a vertical RadSlider.